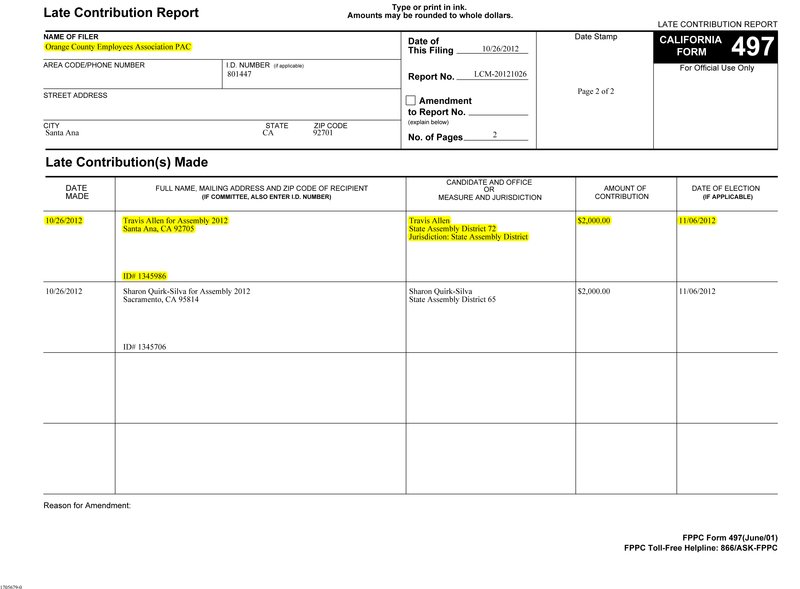 I am not surprised to see Sharon Quirk-Silva on the form but Travis Allen actually caught me a bit off guard. This is a pretty bold move by OCEA to try to curry favor with a Republican and it will be interesting to hear what the Edgar camp has to say about this in the days leading up to the election. This means that almost 50% of people are undecided which will make the mail that has arrived in recent weeks very important. I would also expect to see some hard-hitting roll-calls going out around town about the OCEA money from the Edgar campaign. Fasten your seat belts for what should be some great political theatre over the next 4 days leading up to the election. This entry was posted on November 2, 2012 at 9:50 AM	and is filed under 72nd Assembly District. Tagged: Travis Allen, Troy Edgar. You can follow any responses to this entry through the RSS 2.0 feed. You can leave a response, or trackback from your own site. As mentioned here, http://tinyurl.com/bk9cjrb, could this be payback to punish Troy Edgar for his betrayal of the Democrats in 2006? At the time, Edgar couldn’t have been elected in Los Alamitos City Council as a Democrat, and it’s easy for the conniving, unprincipled and unscrupulous to switch affiliations. Six years later, as a Republican, Edgar couldn’t come close to competing with Gary DeLong in a congressional primary, so the switch didn’t pay off and he ended up settling for what might be considered a lesser race — but not before he lied to a bunch of GOP regulars about his loyalty to them to get their endorsements. There’s a real and present danger that Troy Edgar could be the GOP’s next Doris Allen. This party swapping proves he’ll do about anything to further his political career (perhaps since his business isn’t doing all that well) and he just needs the job.